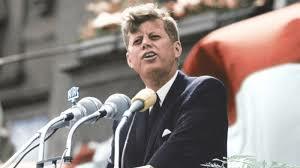 "I am a Berliner" is a quotation from a June 26, 1963, speech by US President John F. Kennedy in West-Berlin. He was underlining the support of the United States for West-Germany 22 months after Soviet-supported East-Germany erected the Berlin Wall to prevent mass emigration to the West. 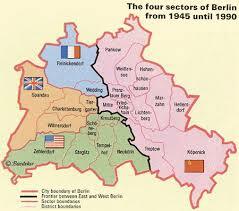 The message was aimed as much at the Soviets as it was at Berliners and was a clear statement of U.S. policy in the wake of the construction of the Berlin Wall. 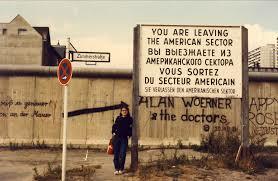 I was born in West-Berlin just three months after that speech. 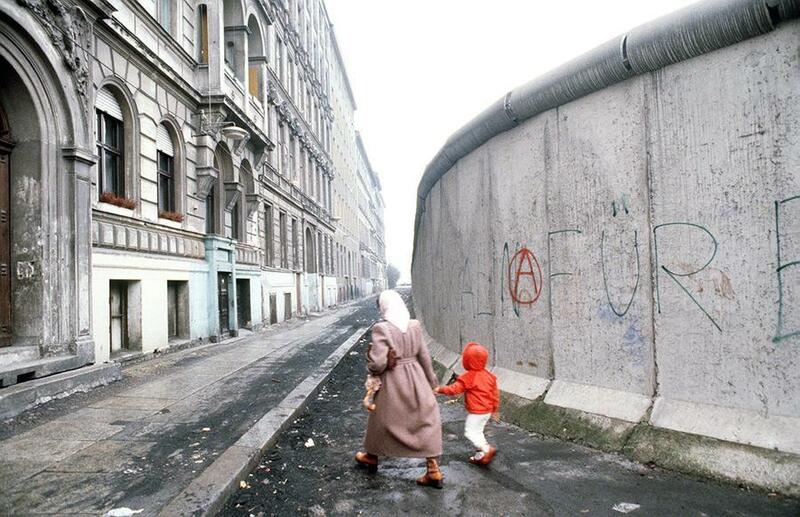 Two years after the Berlin Wall was built. I grew up with it. It was part of my reality. I couldn’t comprehend what she meant at first, couldn’t understand what she was talking about. The Berlin Wall? The Wall that had surrounded me like prison walls all my growing-up years? It’s presence always intimidating, scary, limiting all of us in our desire to travel and many other ways … I didn’t think I would EVER see The Wall come down! It was that much part of my reality. I think if you haven’t lived it it’s hard to imagine what it was like. There was a wall through the middle of my hometown. Houses on one side of a road you couldn’t cross to go to the houses on the opposite side because The Wall was there. We couldn’t just drive out of the city to the countryside. Because there it was, a big wall surrounding our beautiful city, guarded by sharpshooters in watchtowers, patrolled by guard dogs, a strip of minefields along the length of it. On the other side, East-Berlin, mind you, I was the lucky one. 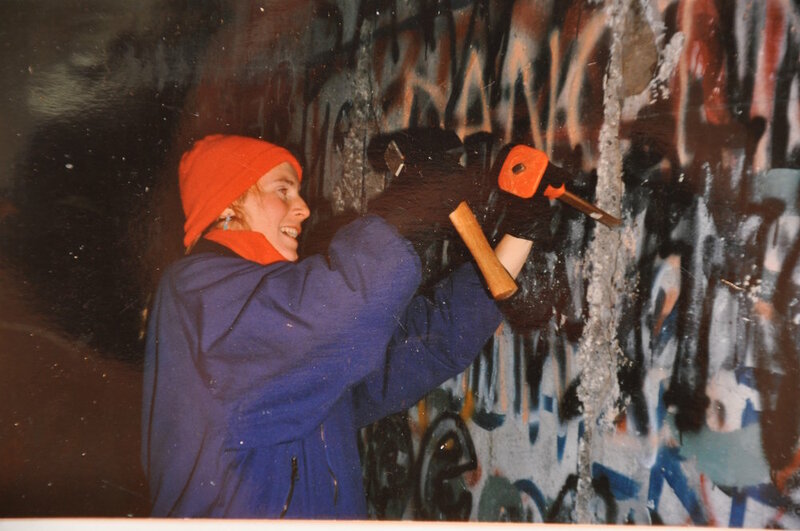 I grew up on the west side of The Wall, in the American sector, thanks to decisions my maternal grandmother and my father made just before The Wall was built. So when my mother told me this unbelievable news, “The Wall just fell”, my roommates and I jumped in the car and started driving from Frankfurt to Berlin. On the Autobahn we started seeing "Trabis" (East-German cars) driving in the opposite direction, an odd sight that didn’t fit our picture of the world as we knew it because we didn’t have those cars in West-Germany. It was around 11pm, a dark & cold night in November, when we reached the border-crossing checkpoint in Helmstedt. What we drove up to was a BIG PARTY, a party like no other!! There were cars parked on both sides of the Autobahn, which on any normal day is illegal. An incredible atmosphere of exuberant joy, happy laughter and cheers as Trabis from East-Germany, loaded to the max with people, where pouring through the checkpoint, crossing the old border. A border they had not been allowed to pass through since 1961. A border separating a country and its' people. The East-Germans were being welcomed by West-Germans with open arms and thermos cans of hot chocolate and tea. It had taken the Trabis 16 hours to make the 2-hour journey from Berlin. There was dancing and rejoicing and hugging strangers as we became one people again. We continued on to Berlin later that night, connected with family and headed straight to the Brandenburg Gate, which had been the symbol of Berlin and German division during the Cold War. It was no-man’s-land. Neither West-Berliners nor East-Berliners could walk through it. On this night we did. In disbelief and awe! I will never forget that the days and weeks that followed. Over time, our lives readjusted to being one unified nation again. It had its challenges, for sure, considering the differences between the two political systems and ideologies. It all worked out in the end, though. So, today, whenever I feel like things are just the way they are and seem impossible to change, I remind myself of those days. Of my reality crumbling, the course of history changing right before my eyes, an a new reality evolving. And I know anything is possible!